I think I've figured out the fedora thing. Both XKCD, my favorite webcomic, and Zero Punctuation (google search it, it's blocked where I'm posting), the fantastically sarcastaranting video game review vlog, feature snappy hats. While I understand that neither of these things are cool to non-geeks, none of my friends are non-geeks, so they're cool to me :). Which brings me to a tricksy topic: geekdom and weddings. A geek wedding, in my mind, is defined as a heavily themed affair. This usually includes light sabers, costumes, and/or the recital of vows in elvish. (Hehe, I'm imagining a wedding with all three of those things, it's awesome!) But what about a wedding of geeks? What is the right balance between personal touches and an uncomfortable level of geekery? It seems to me that there is a time and place for geekiness at your wedding. If the bride and groom's love of video games, Star Wars, or cosplay is part of what brings them together, then I think that should be celebrated. However, there is a lot to be said for keeping your guests comfortable as well. One of my favorite ways to include geek moments is through ceremony readings. I am not big into the idea that people have spent hundreds of years basing their lives on the minute details of wording in a translated text, so I like the idea of opting for literature instead of scripture at my own wedding. To each couple their own, of course. What about a section from Hitchhiker's? A little-known Shakespearian soliloquy? One of the many beautiful "songs" found in LOTR? Those who are in the know about what you are reading, will appreciate what the choice means to you as a couple, and any others will simply enjoy the words. I bow down to its creativity and geekerific glory. 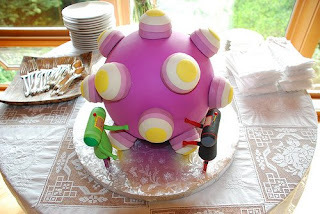 I am fairly certain that even the King of All Cosmos would be pleased with such a tasty Katamari. Thank goodness they ship all over the US because all of their work is spectacular. Clicky the link above to the website for sheer fantasticness, but make sure that you have a drool rag handy and be warned that the site is flash. What about you? How did you incorporate your personal geekiness into your wedding? How much is too much, and how the heck are you supposed to know? Oh, there are MANY ways to include geekery into your wedding. :) I think that was one of my greatest pleasures, in fact. Our WiiToppers were just about my favorite part of the whole damn affair! I wish I would've been able to do a groom's cake. It would have been fun to get Nick a tri-force cake or a flux capacitor or something like that.. Heh. Gasp! They are fantastic. Totally remind me of a great level of Paper Mario... I love the idea of a pixel as a logo for your day, especially one designed by an obviously enthusiastic groom! Where does one find one of those?